The Brownfields are each others' imaginary friends. They have no explanation, scientific or metaphysical, for this. "We are not ghosts and no living person imagines us" they say. It seems they created each other. "Mutually assured arising," they call it. The quartet remember awakening together on a humid, drizzly spring morning, with distant thunder and nearby traffic rumbling in their ears. Holding hands in a circle like a fairy ring, in a betrashed and weedy field behind an abandoned battery factory, they sat up together, looked at each other, and began to think and feel. With no obvious connection to any fleshly creature, they kept each other company as they played and explored the small town around them. In short order, they learned to love plants and animals, and noticed that they had an odd affinity with the top animals who walked, talked and did magic. They preferred and dwelt in the intersection between un-wild and wild, the overgrown and decrepit margins where green meets gray. 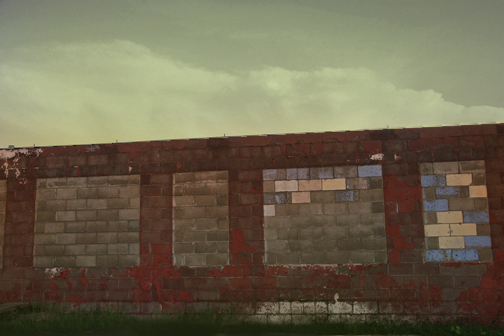 The Brownfields understood each other, but they could not speak in any way that any other creature could hear. Without fleshly lungs to draw in and exhale air, they could make no sound. They could, however, move matter in other ways. Slowly, they learned to touch. Once making things fall over stopped being funny, they devoted much effort to touching the material world in more interesting and complex ways. Touching, watching, listening and making sense of their observations consumed them for many years. They loved the world that couldn't see or hear them. They loved seeing love in the world. They despaired of ever adding to that love themselves. They fell in love with music. Soul, jazz and rock n' roll would leak out of house windows and car doors. The Brownfields were enchanted. Music had rhythms they could tap along to, so they tapped on downspouts and plucked absently at clothelines as their corporeal neighbors played records and did what people do. Very gradually it occurred to each imaginary friend that they might play music together. They knew where musical instruments could be found, and learned when owners of guitars, pianos and drums would not be around to hear the Brownfields make noises that began to resemble music. Moldy basements and music store backrooms would fill with dust as four determined invisibles toyed with chords, cords, keys, amps, and warped cymbals. Rehearsals went on for about 23-24 years. Sometime within the past decade they stumbled upon someone's little home recording studio, from which they learned an entirely new set of skills. Fast-forward to 2012 and the Brownfields have actual recorded evidence of their existence as beings and musicians. They've acquired their own abandoned woodland shack to which they divert electricity, and the shack is filled with essential junk. They play discarded instruments they've refurbished. They have a computer. Using a WiFi hotspot they elected to flat-out steal from Verizon, the Brownfields are preparing to upload a handful of instrumentals and make them publicly available. They are shaking with fear. They desperately want to connect with people by way of music. Rejection frightens them emotionally, though not intellectually. If they are heard and their music does not please, what then? They vow to continue.